For this dish, I prepared parts of the recipe in advance to save on time. I combined the sticky sauce with the chicken in a gallon sized storage bag. Then I prepared the glaze and kept that in a small storage container. When it was time to make the dish, I just placed the contents of the gallon sized storage bag into the Instant Pot and let it cook. Once done, it was time to broil and I transferred the wings to a prepared baking sheet, glazed them with the prepared glaze I made in advance and broiled away. Having everything prepped as much as possible really makes life so much easier! You can even freeze the contents of the gallon sized storage bag for a future freezer meal. In that case, just defrost the night before and then cook in the morning. What I love about this recipe is how the wings have a sweet flavor but that kick of heat (if using cayenne) gets you right at the end. 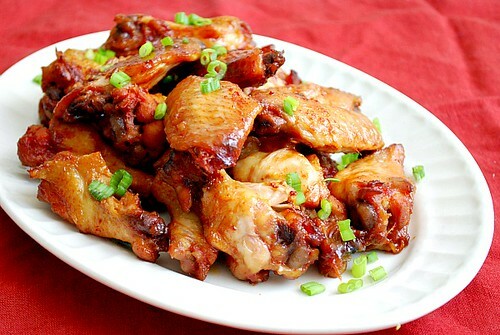 They're truly addicting wings and make for a great and easy to prepare appetizer or game day! If you don't have an Instant Pot, you can get the slow cooker/crockpot recipe version here! Combine 1/4 cup brown sugar, 1 tablespoon soy sauce/tamari. ginger, garlic, and cayenne pepper in the IP. Season the chicken with salt and pepper and add to the IP. When the display reflects 10:00 (which is 10 minutes since the IP has beeped), turn the setting on top of your IP to VENTING. Doing so allows the IP to quickly release any remaining pressure (also known as QPR or QR). I use a wooden spoon to carefully turn the setting to avoid close contact with the potential steam. You may also want to turn your IP away from cabinets to allow the released steam to escape freely. The pin at the top of your IP will drop when all pressure has been released and it's safe to open. Transfer the chicken wings from the IP onto a foil or parchment lined baking sheet. Combine the remaining sugar, water, tomato paste, remaining soy sauce/tamari and a pinch of cayenne (optional) in a bowl to create the glaze. Brush the chicken with the glaze mixture. Bake chicken in preheated oven until lightly charred and crisp, about 10-15 minutes. Flip the chicken over and brush with the remaining mixture and continue to broil until charred and crisp on the second side, about 5-10 minutes.